The over-abundance of books about spirituality speaks to the need many people feel for a more authentic, connected life; the best of these books can open doors without indulging in judgment or condescension. 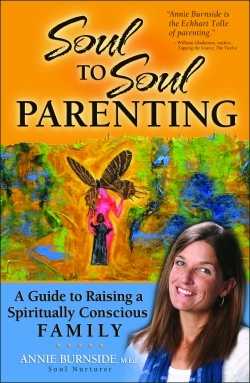 Soul to Soul Parenting earns its place among the best with its honesty, humor, and authenticity. Through a combination of stories about her personal journey, ideas borrowed from the teachings of other spiritual leaders, and old-fashioned common sense, mom, educator, and soul-nurturer Annie Burnside invites her readers to strive for a deeper family experience. There are lots of distractions in the day-to-day lives of families: work, school, sports, entertainment, and vacations. By approaching each element of family life with an attitude of openness and an eye for spiritual potential, parents and children can infuse daily activities with a deeper communion. A clear structure and vibrant text make her book ultimately readable. The first third of the book focuses on what Burnside calls Parenting Vehicles, which are practical, tangible things families can do to get in touch with their spiritual nature. The second part of the book looks more deeply into what these practices teach us, what she calls Soul to Soul Parenting Spiritual Themes. After every chapter she includes book, movie, and music suggestions that reflect and deepen the lesson. Burnside has a Masters in Education and a family with which she has developed this approach to spirituality. Her own family serves as her most frequent example. She shares her family’s special rituals, their spiritual sign, and some of their Soul to Soul Reminders—quotes about spirituality that are posted around their home and car to offer gentle reminders to remain connected to their souls. Her willingness to open her own home and family to the eyes of readers speaks to her inherent strength. Burnside’s text feels honest, authentic, friendly, and nonjudgmental. “One individual may feel God kneeling in prayer on the pew of a beautiful old church. That is absolute perfection. Another individual may find God riding on his Harley through the countryside watching the sunrise. That is absolute perfection.” She makes it clear throughout her book that she is not writing from within the confines of one specific religion, that her viewpoint is inclusive as opposed to exclusive, and that her way of parenting from the spirit may not be the same path other parents will take. With modesty, infectious excitement, and great writing, Burnside offers families an alternative to the fast-paced, materialistic grind in which they often find themselves caught.